At some point, I knew I would take the plunge. It was only a matter of when and where. As long as I can remember, I've loved to cook, play with flavors and ingredients, make my own mistakes and learn. But I've also been yearning to learn more about techniques and train under a more formal setting in the culinary arts. So after much thought and careful consideration, I decided it was time to take a break from my life in science and health research and test the waters in a more professional environment. I wanted to see if I would really love it or not. 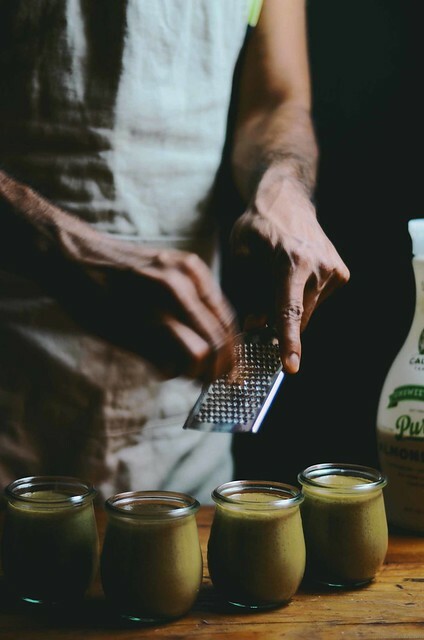 But before I jumped and enrolled in culinary school, I spoke with several chefs and bloggers, I even read a few useful articles such as this one by David Leibovitz and Jennifer. One piece of advice they all shared, go work in a professional kitchen before you make any decisions. So for several weeks now, I've been working as an apprentice at a French patisserie training and learning about pastry making. It's true, the environment is busy, there's literally no time to breathe, the hours are early and long, it can be repetitive but honestly, I find it exciting and I love it! I had heard of many horror stories about differences in expectations and reality that I was very nervous to take this step but I'm very happy I took this initial step. Every day there is something new to learn, like the magic of snow sugar that I use in this recipe to how to achieve the perfectly sliced cut of mousse cake or simple things like how to move with speed and precision when there's a sudden rush order for a large batch of cakes. But beyond learning, I've also developed a deeper appreciation for the creative minds and hardworking people that work in the kitchen. I have no idea what the future holds and I'm still debating on the right culinary program for me but for now it's absolutely wonderful being able to do what you love! My matcha obsession is in overdrive. This cake might also make a good Christmas dessert with its color scheme and perhaps some chocolate holly leaves with raspberries but it also makes one decadent and delicious dessert for Valentine's day. In many ways it also celebrates this new event in my life. 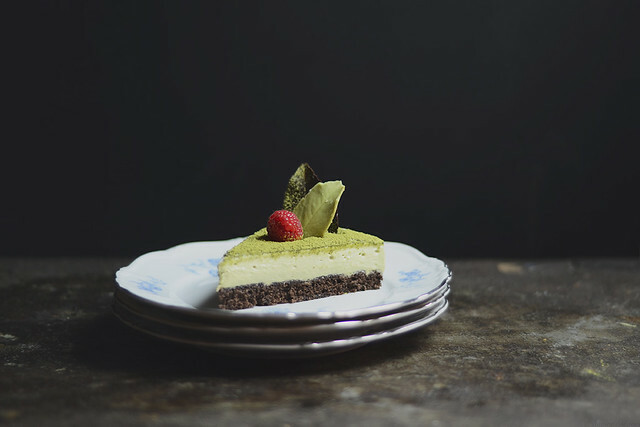 Two types of chocolate and green tea, all layered and creamy smooth. You can make the cake ahead of time and then prepare the mousse on another day and eat it all up in one day. But since it's Valentine's day, you should supposedly share it with your beloved. You can use an 8 or 6 inch circular springform pan instead of the 9 inch pan I used. You will get a smaller cake but with a taller level of mousse. 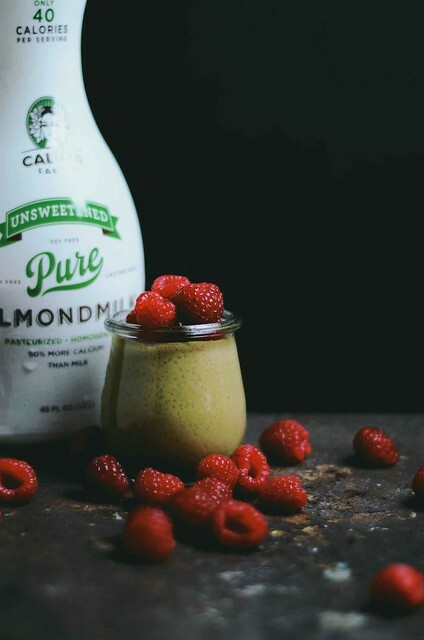 Freezing is your friend in this recipe. Not only does it make it faster to set the chocolate but it also helps to give you nice clean sliced cuts of the mousse cake. I only made 4 leaves of chocolate to decorate the cake but you can go all out! 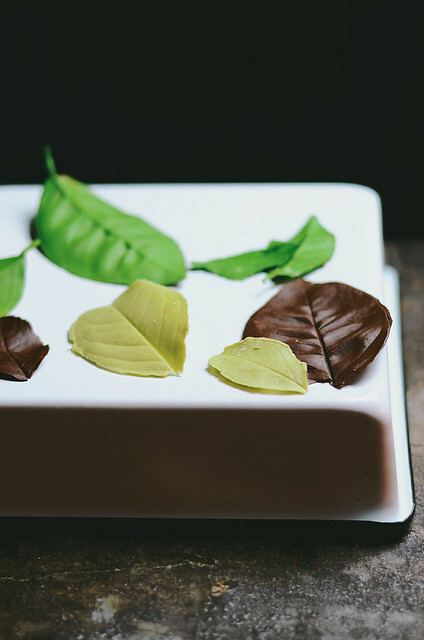 You will have a little leftover chocolate to make additional leaves. Make sure your gelatin is completely dissolved and smooth or you will end up with "streaks/threads" in your mousse and it won't set properly. Snow sugar is the pastry chef's friend, as I have learned recently. We use it to waterproof stuff and prevent our decorations on pastries from getting wet. You can buy it commercially or make your own. I tested and tried this homemade version from Food52 which works very well, it's definitely a keeper! I skipped the vanilla and used white chocolate chips (Ghirardelli). 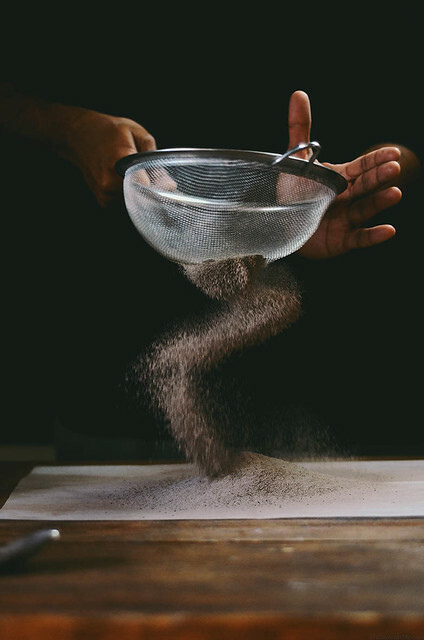 After you've pulsed the rest of the ingredients to as fine a powder as possible, transfer the powder to a ziplock bag, remove any excess air from the bag and seal it. Then crush the fine particles inside the bag using a rolling pin to form an even finer quality powder. Store it an airtight container and use as needed. 1. Wash the leaves under cold running tap water to remove any debris and dirt. Dry the leaves carefully by patting them down with a dry kitchen towel. Keep aside on a baking tray lined with a sheet of parchment paper . 2. 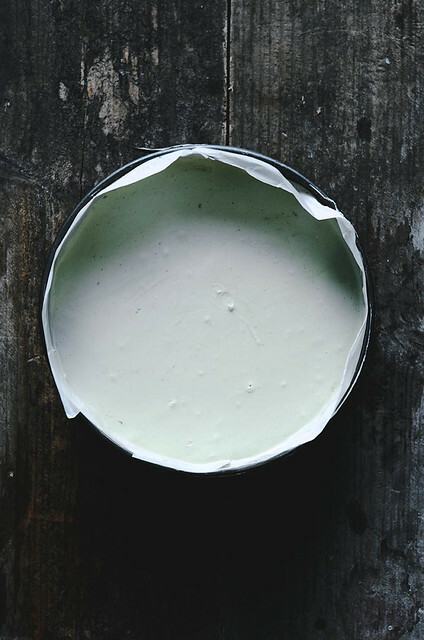 Boil some hot water in a small pan, remove the pan from the stove and place a small heat-proof bowl with the white chocolate and matcha powder and mix until the chocolate has melted and the matcha has mixed in completely to form a light green color. 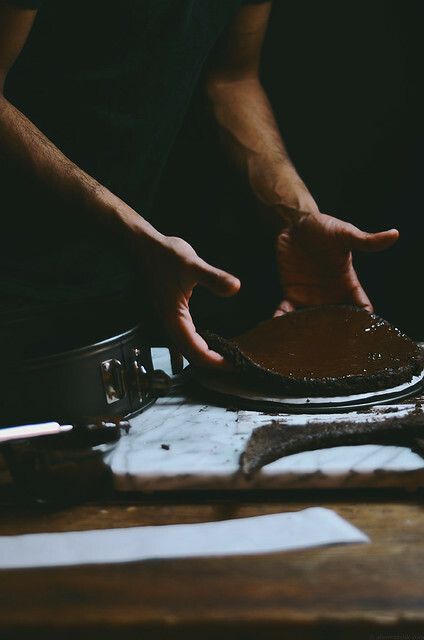 Using a pastry brush, brush the underside of one large and one one small leaf cleaned earlier with a thin layer (not too thin or they will break easily) of the melted chocolate. Place the leaves on the parchment paper from step 1. 3. 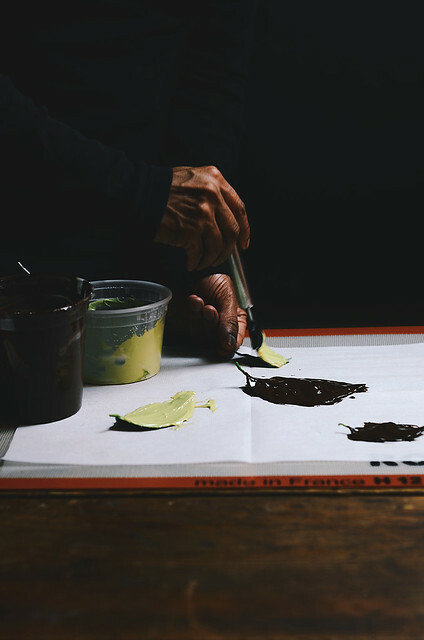 In another bowl, melt the dark chocolate and paint the remaining two leaves just as you did with the white chocolate-matcha mixture. Place the leaves on the tray of parchment paper. Place the entire tray in the refrigerator to harden for at least 10 minutes. 1. Line an 18'X13" baking tray with parchment paper and grease it with the extra butter. Keep aside until ready to use. Place a wire rack on the middle shelf of the oven and preheat to 325F. 2. Whisk the flour, cornstarch and cocoa powder in a medium-sized bowl and then sift the mixture onto a separate sheet of parchment paper four times. Keep aside until ready to use. 3. Place the eggs and sugar in the bowl of a stand mixer and using the whisk attachment, whisk on medium-high speed until the eggs have tripled in volume and the entire mixture becomes pale and creamy. This should take about 5-6 minutes. Remove the bowl from the mixer. 4. Sift 1/2 of the flour mixture over the whipped eggs and fold carefully with a silicone spatula using an outward to inward motion. Make sure you reach the bottom of the bowl when folding to get the dry ingredients incorporated into the wet ingredients. Add the rest of the flour by sifting and fold in the same fashion until a few flecks of dry ingredients are barely visible. 5. Pour the vanilla and melted butter from the side of the bowl into the batter and fold the entire mixture in two sweeping motions. Transfer the mixture onto the prepared baking sheet and using an offset spatula even the surface carefully. The mixture will deflate a little but not too much. Place the pan in the oven and bake for 15 minutes, turing the tray halfway through baking. The center of the cake should be firm and spongy to touch. Remove the tray from the oven when done and allow to cool on a wire rack for 10 minutes. 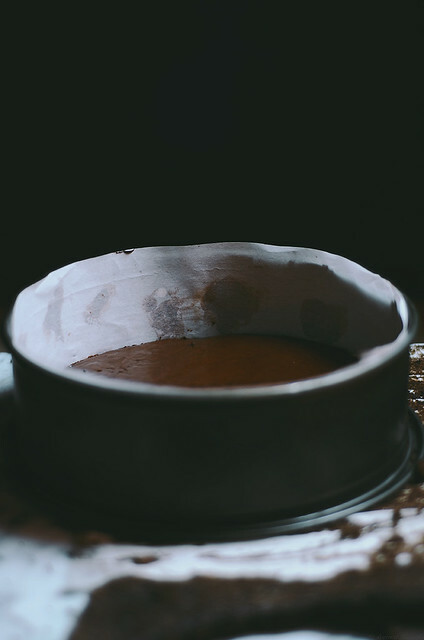 Remove cake with parchment paper from the pan and allow to cool completely. Then wrap the cake with cling film and refrigerate or freeze until needed. 1. Place the cream in a large mixing bowl and whisk with an electric hand mixer on meidum-high speed until the cream forms stiff peaks. This should take about 3-4 minutes. Cover the bowl with clingfilm and refrigerate to chill before use. 2. In a small mixing bowl, pour the gelatin over two tablespoons of water and allow to bloom. 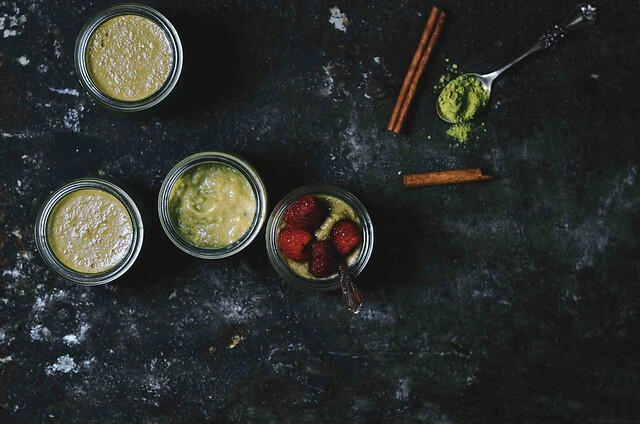 Heat the remaining water in another small mixing bowl and mix the matcha powder to form a smooth paste. Pour this mixture over the gelatin and stir until you get a smooth liquid. 3. Place the egg yolks in a large mixing bowl with the sugar and whisk on medium-high speed until the yolks become pale and creamy for about 4-5 minutes. The mixture will thicken considerably. During the last 30 seconds, pour the gelatin mixture from the side of the bowl and whisk this into the eggs. 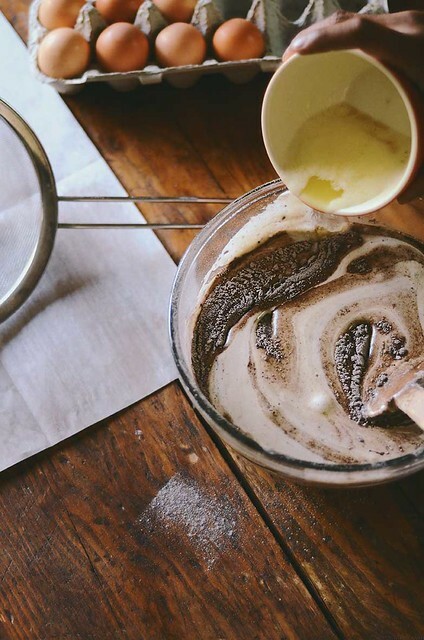 Finally, whisk in the melted chocolate until completely combined. Fold in half of the chilled whipped cream using sweeping outward to inward motion with a silicone spatula (just like you did for the genoise cake). Fold in the remaining cream and keep aside. 1. Cut a 9" circle of the prepared and pre-chilled/frozen chocolate genoise cake (NOTE: You can also just use the ring of the pan to cut the circle, before you line the side of the pan with the strip of parchment paper). Save any extra leftovers and unused cake in the freezer by wrapping the cake in clingfilm and then in airtight bag. 2. Take a 9" X 2.5" circular springform pan. Cut one 9" circle and a 28" X 2" strip of parchment paper. Line the base of the pan with circular sheet of parchment paper. Using a very little amount of vegetable oil or melted butter, line and stick the strip of parchment paper around the ring of the pan. Assemble the pan together with the ring. 2. Place the cake on the base of the lined pan. 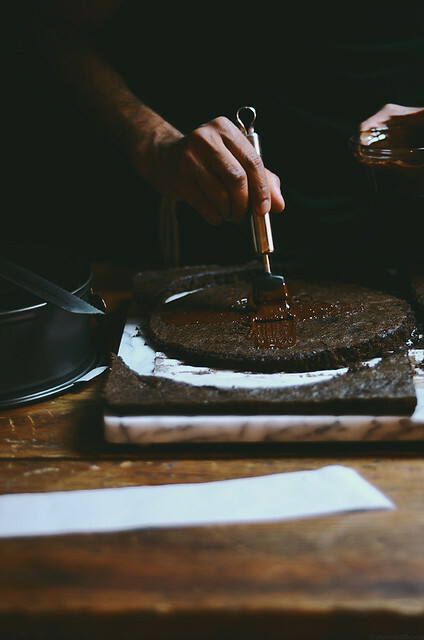 Using a brush, coat the exposed surface of the cake with a little bit of the melted chocolate in a thin layer. It does not have to perfect, you want just enough to prevent the cake from getting too soggy. Allow to cool until the chocolate has hardened and set, this will happen fast depending on how cold the cake is. If the chocolate is taking too long to set, freeze the entire pan with the cake for 2-3 minutes until hardened. 3. Pour the mousse filling over the cake after the chocolate layer has hardened. Level and smooth the surface with an offset spatula. Cover the pan with clingfilm and refrigerate for at least 4 hours to overnight. You can also freeze the cake at this point. 4. Freeze the cake in the pan for at least 2 hours before decorating. To release the cake, unlock the springform pan. Dust the surface the cake first with a thin layer of the snow sugar and then with the matcha powder using a tea strainer. There should be no visible white spots from the snow sugar. Then slowly unwrap the parchment paper from the sides of the cake. Slide the cake onto a cake board and decorate with the prepared chocolate leaves and a few fresh raspberries. Cut the chilled mousse cake with a sharp serrated knife (Note: It is easier to get nice clean cuts using a sharp serrated knife on a frozen mousse cake, just wash the knife between each cut to keep it clean). 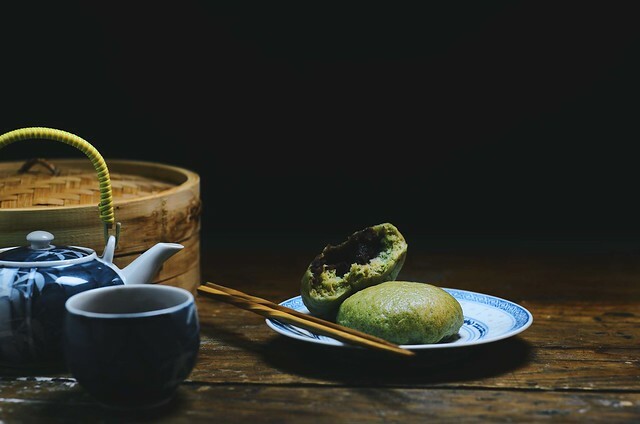 Though you can prepare and eat these at any time of the year, these matcha and red bean Chinese steamed buns make the perfect holiday treat. Green on the outside and red on the inside, these little spongy buns are filled with sweet goodness! Eat them as dessert or include them in your breakfast or brunch menu, either way I think they need to become a holiday staple. 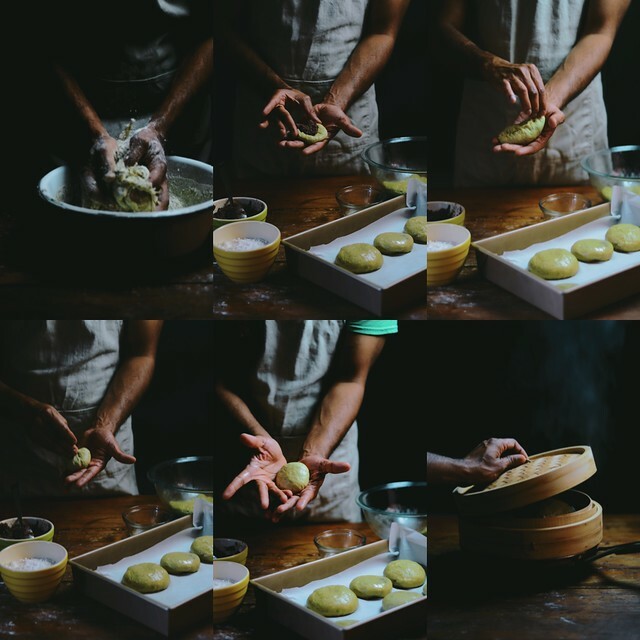 I've been meaning to update a rather old post of mine for Chinese steamed buns (savory cauliflower and sweet mung bean coconut fillings) and include a step-by-step photo instruction guide to make it easier. This was the perfect excuse to finally revisit and do just that. You can find sweet red bean stuffed steamed buns at almost any asian grocery store. Living in the Bay Area, I'm a little spoiled because we have several asian markets that carry fresh and frozen steamed buns. But since they are rather easy to make at home and taste great, coming straight out of a hot bamboo steamer, I think they justify the effort and time. 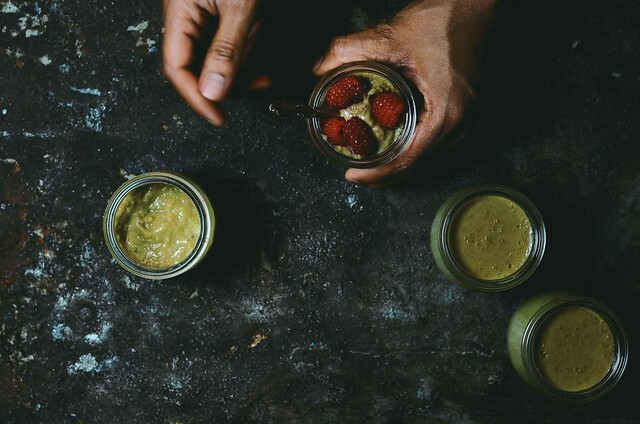 Matcha is one of my favorite ingredients to keep stocked in my pantry, its vibrant green color and delicate taste make it an exceptional and versatile ingredient to work with. I prepared the sweet red bean paste using a recipe from my friend Nami of Just One Cookbook, it's easy and tastes delicious. Nami has a lot of wonderful Japanese recipes on her site and you will love her site. There's lots of good stuff on Japanese cooking at home! I've listed instructions for preparing this dough by hand or by a kitchen stand mixer. 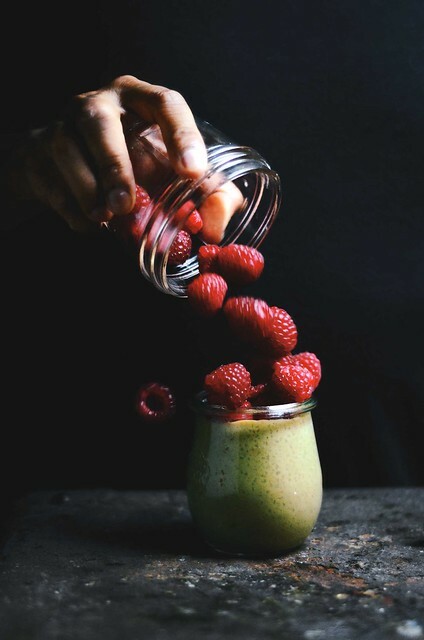 I ended up using 4 tablespoons of matcha for a deeper green color and a richer flavor. I've noticed some brands being a little lighter or stronger on the flavor and color, so adjust it accordingly. I added a little bit of green cardamom but feel free to skip it. I love the way it compliments the flavor of the sweet red bean paste. This recipe can easily be halved to make 12 buns. You can also freeze any extra cooked buns for later consumption. 1. Take 1/2 cup water and heat it to 110F. Stir in the yeast and 1 teaspoon of sugar. Let this sit for 5 minutes until the mixture is completely frothy. 2. While the yeast mixture is standing, bring the remaining 1/2 cup of water, milk, salt and 1/4 cup sugar to a boil in a small saucepan on medium-high heat. Reduce to a gentle simmer and keep hot until ready to use. 3. Place a wire rack in the center of the oven and preheat to 200F for 5 minutes, switch the oven off but keep the door shut to retain the warmth. Note: You can use either the hand method or the kitchen stand mixer method to prepare the dough. 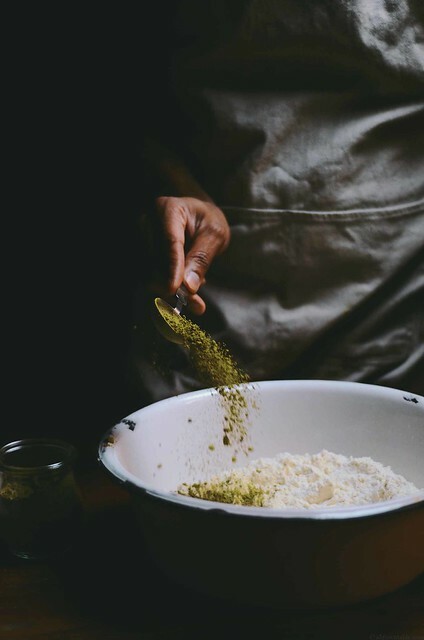 a)Hand Method: Place the matcha powder, cardamom and flour in a large mixing bowl. Dry whisk to mix the ingredients and make a well in the center. Pour the yeast mixture into the center and stir with a wooden spoon. Then quickly whisk the vegetable oil into the hot milk-water mixture and pour it into the flour. Stir with a wooden spoon until almost combined, then bring the dough together with your hands to form one large ball. 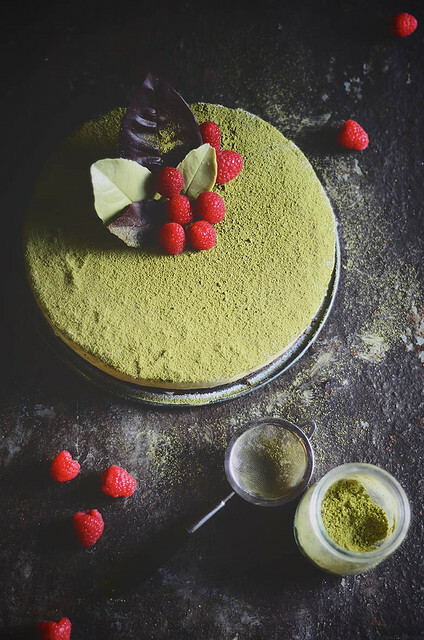 There should no visible flecks of flour and the dough should be evenly green in color from the matcha. 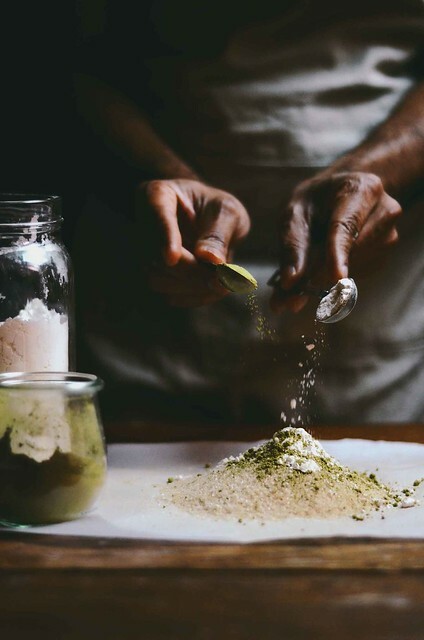 b)Kitchen Stand Mixer: Place the matcha, cardamom and flour in the bowl and using the dough blade attachment, dry mix until ingredients are evenly mixed on low speed. Then increase the speed to medium-low and pour the yeast mixture into the dry ingredients. 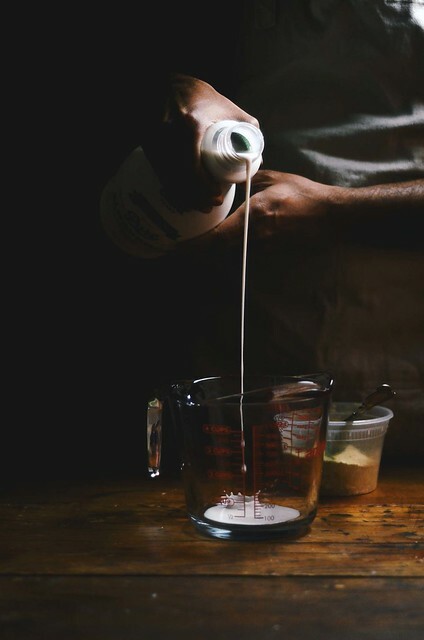 Now quickly whisk the oil into the hot milk-water mixture and pour it in a running stream from the side of the bowl of the stand mixer. Mix the ingredients on medium-low speed for about 1 minute and then increase the speed to medium-high until completely combined. Remove the bowl from the mixer and then using your hands bring the dough together to form one large ball of dough. 4.Transfer the ball of dough to a large lightly greased bowl and cover loosely with a clean kitchen towel or cling film. Place in the pre-warmed oven and allow to rise and double in size for at least 1 hour. After the dough has doubled in size, remove the cloth/cling film and punch the dough to deflate. Cover and allow to rise for another 1 hour in the oven (if the oven is cool, you can preheat it again as described in step 3). 5. After the dough has risen for the second time, divide the dough into 24 equal parts. Shape each part into a ball using your hands and keep aside covered with a clean kitchen cloth. 6. Lightly grease your palm with a little oil. Take one part of the divided dough in your palms. Flatten the dough a little to form a thick disc about 2 to 3 inches in diameter. Place 1 tablespoon of the sweetened red bean paste in the center. Pinch the edges of the disc to seal the filling in. Then bring the two pointed ends of the bun towards each other and form a ball. Using your fingers twist and seal the bun. Carefully rotate the bun between the palms of your hands to shape the bun. Place the bun in a large tray lined with parchment paper or alternatively place the bun individually in large paper cupcake cups (the latter option makes it easier to handle the buns and cook). Cover with a clean kitchen towel or cling film. Prepare the rest of the buns and place them about 3-4 inches apart from each other. Allow the buns to rest covered and rise for 1 hour in a warm oven (as described in step3). 7. To cook and steam the buns: Place your bamboo steamer over a wok. Pour enough water into the wok (the water level should be slightly lower than the bamboo steamer) and heat on medium-high and bring to a boil (If you don’t own a wok, you can use a saucepan that is wide enough to allow the bamboo steamer to sit on). While the water is heating, line the bottom surface of the bamboo steamer with parchment paper (it doesn’t need to be cut to size, just wide enough to allow the buns to sit). Place 3 buns (if you're using paper cups then use directly) at a time in the bamboo steamer (this will vary depending on the size and the number of compartments in your bamboo steamer, adjust accordingly. Just remember to keep enough space between the buns as they will expand during cooking). Cover the steamer with its lid and place the steamer over the saucepan of boiling water. Allow to cook for 15-20 minutes. The cooked buns will rise and be shiny in appearance yet soft and spongy to touch. Cook the rest of the buns in the same manner. 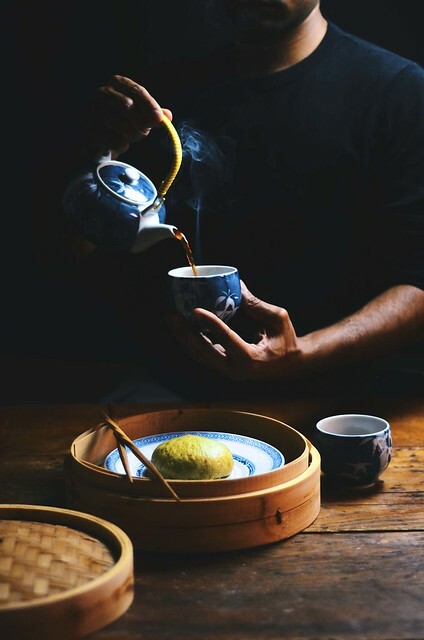 Serve the freshly steamed buns with hot tea. Note: The freshly cooked buns can be frozen and stored for up to 3-4 weeks. As soon as the buns are frozen, allow them to cool to room temperature. Place them in an airtight freezer proof ziplock bag and freeze. To reheat, microwave each frozen bun wrapped in paper for about 30 seconds. You can use commercial canned red bean paste from any Asian market or make it at home. I used this easy recipe from my friend Nami, of Just One Cookbook. The only substitution I made to her recipe was the sugar, I halved the quantity of the ingredients listed and I used 3.5 ounces of light brown sugar instead of regular sugar to give the filling a deeper flavor. Once the paste is cooled, I pulsed it a few times using an immersion blender to make it completely smooth. You won't end up using all of the red bean paste to fill the buns but you can save the extra and use it later in another recipe.